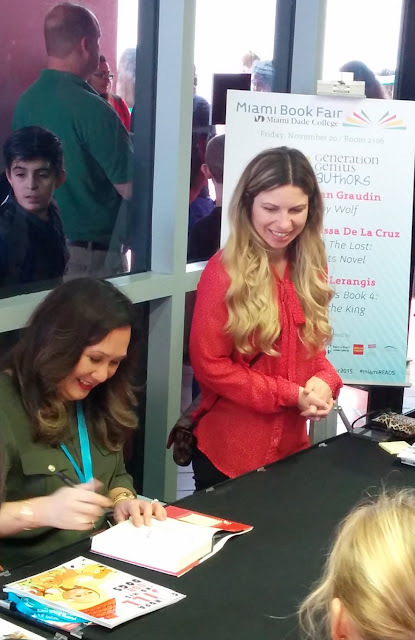 I cancelled my birthday and changed it to November 20th when I found out that New York Times Best Selling Author Melissa De La Cruz will be in Miami Book Fair that day. I told my family that they can forget whatever gift they were planning to give me. All I want was money for my Miami trip. I won't let my budget stop me from attending the book fair. I even thought of starting a campaign requesting people with good hearts to help my dream come true - meeting my favorite Blue Bloods series author. Months passed by, I planned every detail of my "birthday" - the day when I'll finally see Melissa De La Cruz face-to-face. However, the day before my special event, my dinning area got flooded. I kept my cool and tried to fix everything. I won't cancel my trip. I planned this for months. I fell asleep very excited for my big day. But to my dismay, when I stepped on my living room the next morning everything was soaking wet including all the electronics. It was 6:30am and I need to drive 4hrs just to be in Miami. Melissa's workshop was at 11:30am. I tried so hard to keep my tears from falling so I can keep moving my stuff to prevent more damage on them. It was already 8:30am when I finished moving everything from the living room to my bedroom. I've already lost hope of meeting my fav author but I still used short cuts just to be in Miami as fast as I can. I arrived in Miami Dade College around 12:30pm. I didn't know where Building 2 was. I just kept walking while telling myself that if I am meant to meet Melissa then I will. Surprisingly, I found the building without stopping to ask someone for direction. My feet seemed to know where to go. The reading was over when I got to the venue. Luckily, Melissa had tons of fans asking for her autograph. I was the second to the last person in the line. After all the hurdles, I was able to have a chat with Melissa and even gave her a copy of my book . Some may say, "Why went through all the troubles for a few minutes of seeing an author?" Well, why not? First of all, Melissa De La Cruz is not just an author. Please go to her website or to Amazon to check all her achievements and awards or else this post won't end. Second, she inspires me to keep writing. And the most important of all, she shows me that everyone has the chance to succeed as long as you keep dreaming and working hard. Someday, I'll be like her. Any hardship I went through, going through and will go through will be worth it as long as my feet are heading to where they are suppose to go.